With Father's Day and graduation season upon us, honor a loved one on the PATH Intl. website. Click here to learn more. It only takes $25 to show your love this Spring! If you are interested in learning more about mobile giving, DonorPro has a free webinar on the topic June 5, 2 p.m. Eastern time. Click here to sign up for this informative webinar. If you think that safety and standards in space exploration have nothing to do with the equines and participants at your center, you might be surprised. 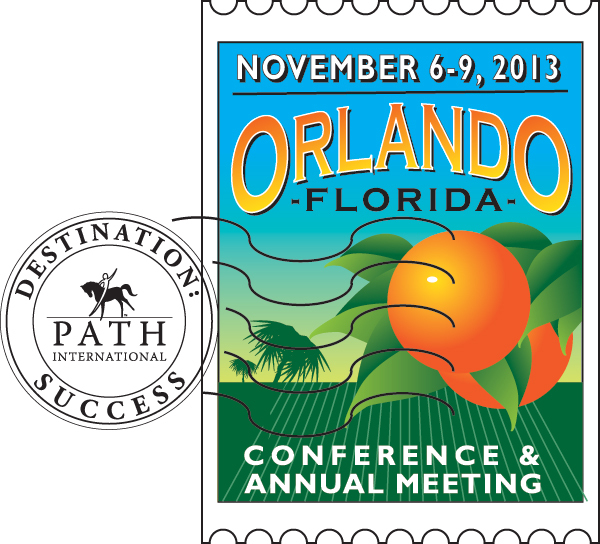 Join us at the 2013 PATH Intl. Conference and Annual Meeting keynote luncheon on Thursday, November 7, in Orlando, FL, as we launch into stories about how safety and standards in space exploration can help us understand those issues in EAAT. Brooks Kimmel, Deputy Director of Safety, Health and Mission Assurance for Abacus Technology Corporation at NASA's John F. Kennedy Space Center, will be the keynote luncheon speaker. Consider the mission of Apollo 13 in 1970. Astronauts Lovell, Haise and Swigert were stranded 205,000 miles from earth in a crippled spacecraft, while those at Mission Control worked heroically to bring them home. They mapped out all the options and never considered that they might not succeed. 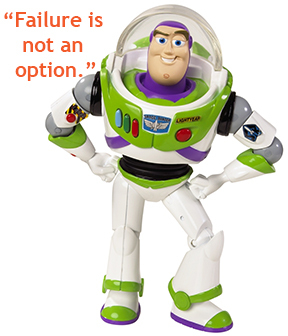 The words still ring down through the years and shape the drive and passion of those who work at NASA today: "Failure is not an option." Standards ensure the success of NASA missions and PATH Intl. Centers, and provide a tested flight plan for everyone involved. Brooks ensures the success of each mission for NASA by being certain that critical systems never fail in the exhilarating but zero-tolerant environment known as space travel: Because failure--whether at NASA or at PATH Intl. Centers--is not an option. Mark your calendars now for the conference, the theme of which is "Destination: Success." You won't want to miss this out-of-this-world experience. Registration will begin in July. The 2013 PATH Intl. Conference and Annual Meeting page has detailed information on the Orlando, FL, conference site and hotel, the Caribe Royale, which is close to all the attractions for which Orlando is famous. To reserve your room, call (888) 258-7501 and reference PATH Intl. or reserve your room online. Volunteers are a necessary component of any nonprofit, but for PATH Intl. Centers, volunteers are very often the heart and soul of a program. Help your volunteers start out right by signing them up for the online volunteer self-study course. PATH Intl. Center Members have FREE access to this course. Email the name of your center and the name and email address of the volunteers you are signing up to Jorian Stuckey at the PATH Intl. office. they're worthless, but because they're priceless." Congratulations to Amanda Leithead, a volunteer at Special Equestrians, Inc., a PATH Intl. Center in Warrington, PA, who was recently awarded a $1,000 scholarship by the EQUUS Foundation as part of its "Champions" program. 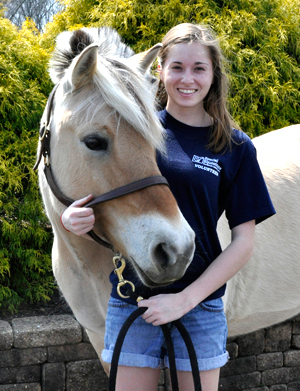 A senior at Nazareth Academy, Leithead will be entering Saint Joseph's University as a freshman in the fall of 2013, where she will pursue a degree in psychology, and in the future, she hopes to become a certified therapeutic riding instructor. She has been a Special Equestrians volunteer for two years. Champions is the EQUUS Foundation's incentive-based equine service volunteer program sponsored by Ariat International to recognize and reward individuals and organizations on the carrots4acause network. As a Champion, volunteers have the opportunity to win service scholarships and Ariat gift certificates. Click here to learn about the Champions program and to sign up. Continuing our focus on hoof care, this edition of Equine Tips focuses on quarter cracks. A quarter crack is a full wall thickness defect that originates at the coronary band and has the potential to run the length of the hoof wall. Quarter cracks are different than most other hoof cracks in that they start on the inside of the hoof and eventually break through the hoof wall. The typical first sign of an impending quarter crack is a bulge on the affected quarter of the coronary band. Be careful that a quarter crack is not misdiagnosed as an abscess. Read more.